Fire is enthusiasm that's bursting at the seams. It's growth itself. It kindles the joy of living. Its currents carry us to play, exploration, and self-expression. 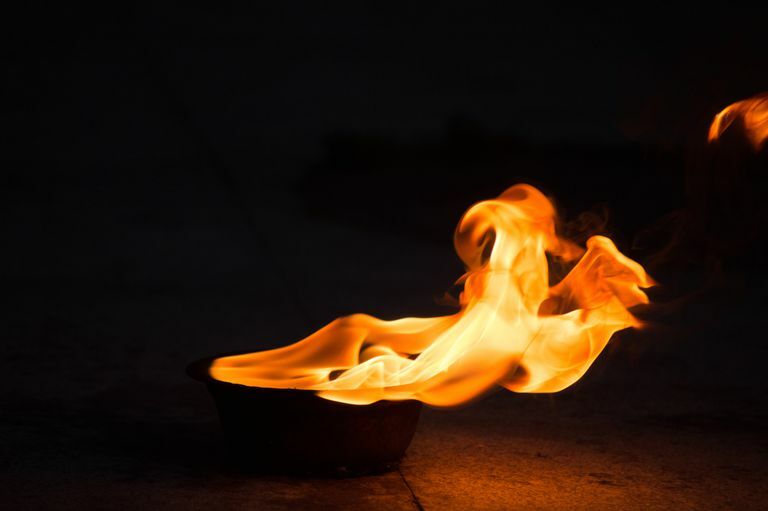 Fire is one of the four elements -- the others are earth, air, and water -- and each one is important for your sense of well-being. The spark of fire is contagious, and fire sign people act as catalysts for others. We need fire to feel passionate about what we're doing. It helps us burn through self-doubt and karma. It's the conduit for acting on what makes us feel alive. The Zodiac signs of the fire element are Aries, Leo, and Sagittarius. The fire element is expressed through inspired acts that are led by intuitive impulses. It's the surge forward into new ground, often without restraint. Aries is cardinal fire -- surging, flashing, and initiating. Leo is fixed fire -- warming, stabilizing, and fully expressing. Sagittarius is mutable fire -- bendy, swift, and far-flung. The spark of fire creates warmth from the inside out. It's the natural urge that's associated with being inspired, dynamic, animated, engaged, alive, and motivated. It's the fire in the belly or mind that overcomes stagnation. We fan the flames of fire in our charts by taking risks. This creates its own momentum, as our cheeks flush with the excitement of being at the edge. A lack of fire can sometimes lead to inertia. It's hard to see the point of life. You can feel without joy. You're caught up in the repetitive, mundane, heavy, or superficial. Nothing rouses you from boredom. You are listless, uninspired, half-dead. Fire is joy. From Per Henrik Gullfoss, in The Complete Book of Spiritual Astrology: "The essence of the element of fire is joy. You may wonder how so many religions lost track of what really matters and became lost in fear, guilt, and the notion that life on Earth is nothing but an experience of limitation and suffering." Fire, says Gullfoss, is the pure joy of living and growing. It's living in the present moment. Planets in fire, he says, are "to reach for and hold a state of eternal ecstasy and bliss." Encourage someone whose spirits are low. Get the blood pumping with more oxygen, through exercise and fresh air. Stop talking about your dreams and take one small step to make it real. Go on a brisk walk when you feel mentally fatigued. Give in to fantasy about where you'd like to travel. Make time for creative self-expression. Find healthy ways to burn off nervous energy. Use candles in your meditation. Tell stories around the fire. Sign up for a class that scares you, because you know it'll change you. Spend more time with inspired people. Dare to drop the cynicism and train yourself to see the bright side. Seek out funny angles or entertainment for one heart-healthy laugh per day. Wear more warm colors -- reds, oranges, yellows. Bring warm lighting and colors into your home. Speak your truth, even though you know it's going to rile people up. Take a risk and present yourself in a bold way. Try hot yoga, like "Kick your Asana" or Bikram. Plan a trip (can be a day trip or weekend excursion). Pursue activities just for the fun of it. Reclaim something that made you joyful as a child. Leave the schedule open for spontaneous desires. Do what makes you feel free.